Subhashis Banerjee is a professor in the Department of Computer Science and Engineering at the Indian Institute of Technology (IIT) Delhi, where he currently holds the Ministry of Urban Development Chair. Previously he has held the Microsoft and Naren Gupta chair professorships at IIT Delhi. 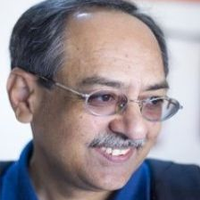 Professor Banerjee's primary areas of research are computer vision and machine learning, with a special emphasis on geometric algorithms. He has also worked extensively on design of computing and networking infrastructure and IT services. Recently he has started examining policy issues in digital identity, data and privacy protection, and fairness and reliability of machine learning algorithms.